The real Texas Hold’em Poker experience, looking at your opponents in the eye and bluffing your way to victory! Play with your friends anywhere any time, all you need is WIFI connection, one iPad and your respective iPhone or iPod Touch. Engage in a game to find out who is the best bluffer, the best strategist and the most cunning player. You just have to sit around the table and start playing, there is no shuffling of cards or distribution of chips, only the best of Texas Hold’em Poker. ♠Up to 4 friends over a WiFi network. ♠Determine each player starting chips. ♠Let iPad do all the background work while you just sit and play with your friends. ♠iPad takes the roll of your personal dealer, shuffling and dealing cards. ♠Great iPad user interface design. ♠Buy the iPad app and download any iPhone/iPod Touch Texas Hand app for free. ♠Intuitive user interface and app feedback. ♠Easy to start and quick to play Texas Hold’em. 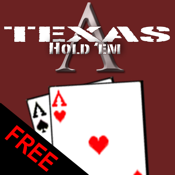 ♠The only Texas Hold’em app designed to play with your friends, not strangers. ♠Look your opponents in the eye, bluffing is half the game. ♠Poker night just got better!